At Stanford University in 1971, a team of psychology department researchers recruited twenty-four undergraduate students to take part in a mock prison experiment to study what would happen when individuals are randomly selected to either be stripped of their civil rights as fake inmates or given the almighty power of authority as guards told to keep the peace. After a relatively uneventful first day, a riot was staged within the next twenty four hours. And once some of the previously “healthy and stable” participants began adapting to their roles in ways that even the professor in charge never would’ve predicted, sadistic treatment, abuse and psychological breakdown followed, leaving the university no choice but to pull the plug on the controversial project just six days after it began. All in all, it’s a shocking testament to the dangers of peer pressure, group think, the rapid slide of right and wrong once things become unstable, and a frightening reminder that we’re never sure just how a person will react to heightened circumstances. But perhaps the biggest success the Stanford study ever had was in its failure. Namely, reminders of similar horrors resurface on the news (Abu Grahib) and speculations about what occurred and what could possibly go down under similar circumstances showed up in the book Black Box by Mario Giordano, which led to two cinematic interpretations, including the 2001 German thriller Das Experiment from filmmaker Oliver Hirschbiegel and this straight-to-disc 2010 American remake. Suffice it to say given the Stanford connection and all of the moral complexities tangled up within the issue, the topic is not only timely and compelling but also strong enough for us to understand why Oscar winning actors Adrien Brody and Forest Whitaker would climb aboard the project based on the premise alone. Unfortunately, they should’ve looked much closer at the overall screenplay and the cinematic vision of writer/ director Paul Scheuring. 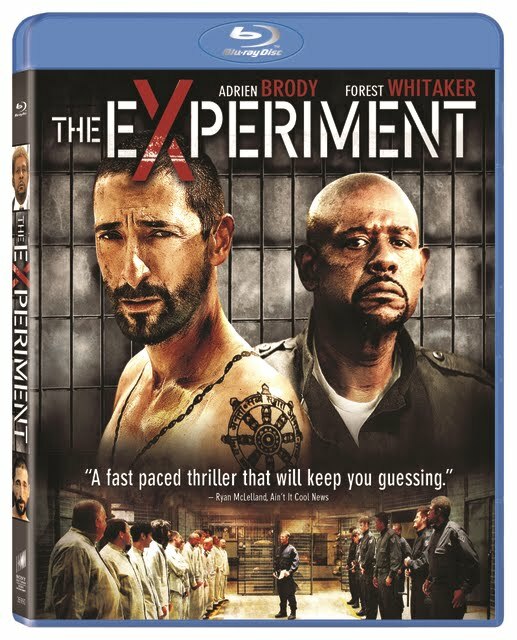 While on paper he seems like an ideal fit when you discover that Scheuring is the creator of TV’s Prison Break , tragically just like the Stanford experiment they’re revisiting, as soon as participants Brody and Whitaker assume their roles as inmate and guard respectively, the crazed intensity of the group’s unraveling mental condition and growing reliance on violence quickly takes over the film. Similar to the revelation of the researchers that they weren’t the ones running the study, we never feel fully convinced that Scheuring is the man in charge since it all spirals out of control and becomes less a psychologically riveting puzzle than a nihilistic punishment picture that asks you how much you can take. Ultimately, despite an impressive docudrama visual flavor that shows up well like we’re watching HD security camera footage on the Sony Blu-ray, as The Experiment continues, the only thing keeping us tuned in is the intimidating turns by the Oscar winning leads but we even grow wary of those once we pass the halfway point and conclude that there’s nowhere to go but down.